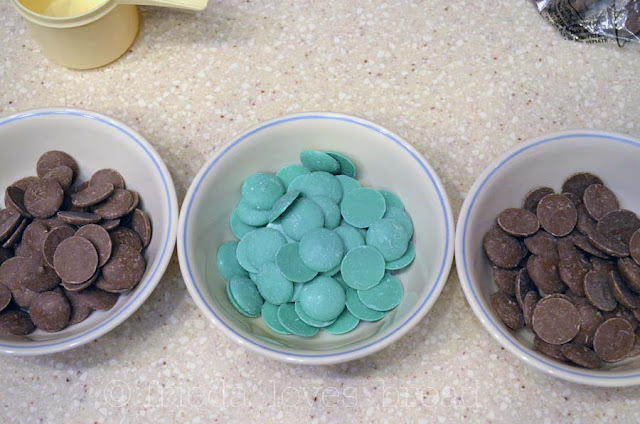 When I saw these little chocolate chocolate and mint flavored discs at Orson Gygi, I knew what I needed to make! 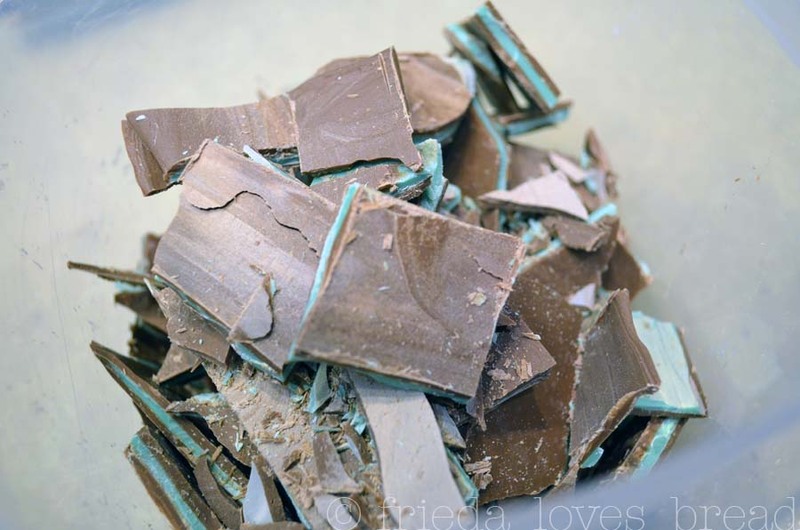 Tip: You won't want to use mint chocolate chips for this recipe, as chips have an ingredient that holds their shape, whereas candy coatings melt easily and do not hold their shape. If you can't find Mint flavored compound candy coating, you can add an oil-based candy flavoring, such as Lorann's peppermint oil to some green candy melts. 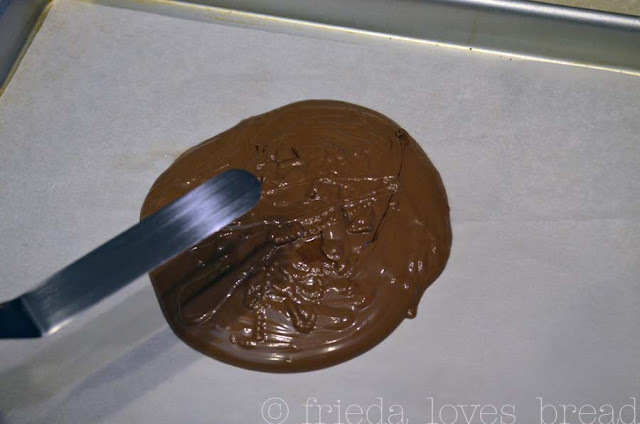 What is the difference between chocolate and compound coating? Chocolate is made with cocoa butter and compound coatings are made with vegetable oil. They are less expensive than chocolate, melt at a lower temperature, are easier to work with, and will set up more readily. I have used the white chocolate melties (found at Winco) for a caramelized white chocolate sauce, which is excellent as a topping or used in making White Chocolate Ice Cream. I also used these white chocolate discs for molding my Caramel Nut White Chocolate Squares. I am learning that making candies are a lot like making bread. You have to try, make notes, try again, consult the Internet, make more notes, observations, and repeat the process until you have perfected the product. Don't be afraid. Don't be nervous. Go for it! Here is my first attempt. Sad, isn't it? Observation #1: Chocolate was difficult to cut. It basically broke into shards. Tasted just fine. It will be great as a topping on a bowl of ice cream or tossed into a milkshake! Lesson Learned: Don't wait 3 hours for chocolate to set into a solid block. This is what I was able to salvage. Observation #2: White, grainy film on top of chocolate. Info on the Internet tells me that it is called "bloom." Because this is a compound chocolate, it is more specifically called, "sugar bloom." What caused it? One reason is dampness or condensation. I put this tray of chocolate in the microwave to keep it away from my cat, who will eat anything. I am sure that the warmth in a closed environment caused condensation to form on the top layer. Lesson learned: keep all forms of moisture away from chocolate. That means water, steam, and condensation! Here is my second attempt and how I did it, step by step. Measure your chocolate. I used 60 wafers for each layer, which is a heaping cup, or around 5 ounces. I don't have a double boiler, so I used DRY microwave safe bowls that fit nicely into a small sauce pan. When you put water into your saucepan, make sure it doesn't touch the bottom of the bowl. Bring the water to a boil, and REMOVE THE PAN FROM THE STOVE. 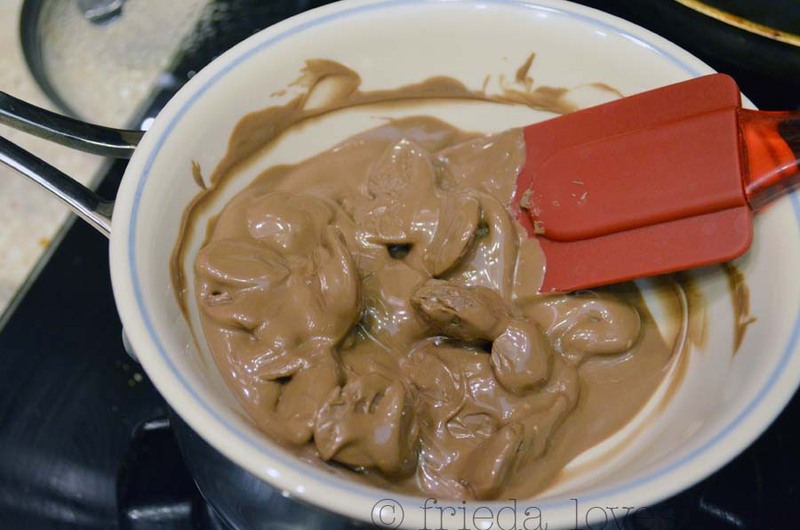 Place the bowl of chocolate onto the pan and stir until the chocolate is almost dissolved. If using a spatula, make sure it is DRY and heat resistant. Make sure that NO STEAM escapes from the saucepan, as it will enter your chocolate and cause it to streak or seize. Melt all the bowls of chocolate and put them onto an absorbent kitchen towel to mop up any steam that may be on the bottom of the bowls. I have a baking sheet lined with parchment paper and an offset spatula ready. The slight "bend" in the spatula make it easier to spread. If you don't have one, try a small pancake turner or even a rubber spatula like my red one, above. Pour the melted chocolate into the middle of the parchment paper. Spread to a 1/8" thickness, or about a 10"x7" rectangle. 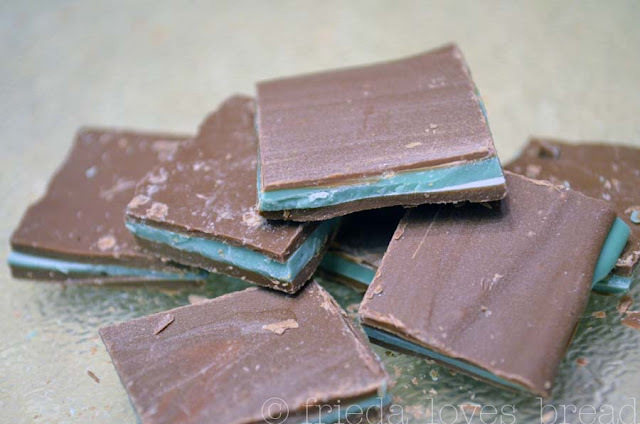 Pour the mint layer on next, spread to the edges, and let it set to an almost matte finish. Repeat with the next layer of chocolate. When the top layer has a matte finish, move the chocolate onto a flat surface for cutting. 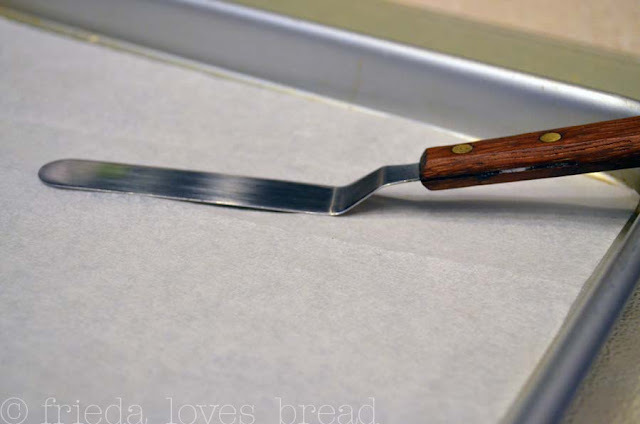 Using a thin, sharp knife, make your cut. I began cutting too soon, as the chocolate stuck to my knife and began to pull ... telling me it needs a few more minutes to set. How long does it take to set? It depends on how thick your layers are. Don't wait three hours like I did ~ Here is a perfect cut! 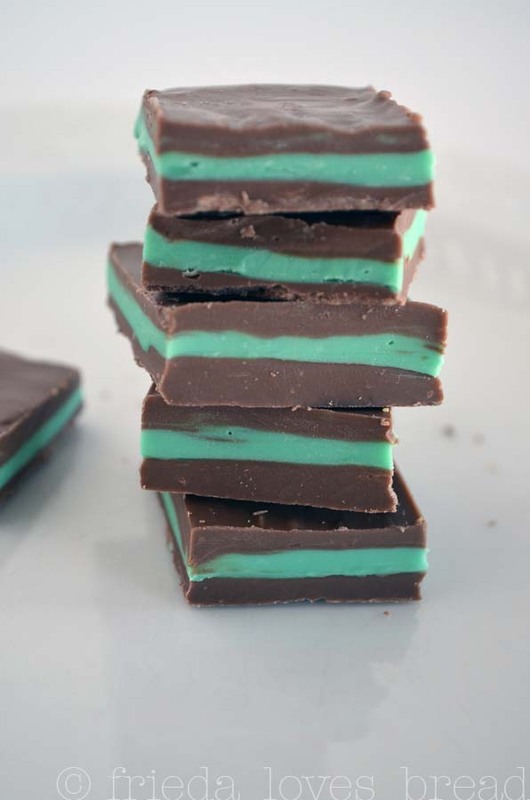 These sandwich chocolate mint squares are simple to make and easy to impress. 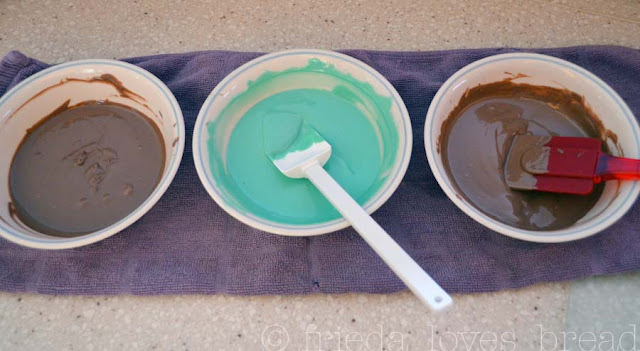 You can find compound coating in most bakery or candy making shops. 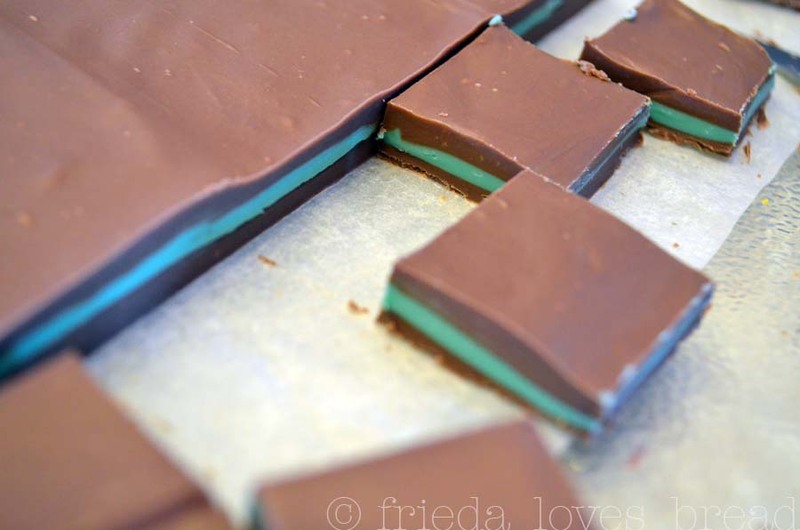 Don't wait too long between layers or the mint sandwich will not stay together. Best made in a dry environment or a day that is not humid. Small baking sheet, at least 10"x7"
1. Line baking sheet with parchment paper.2. Put compound coatings in 3 separate bowls that will fit in saucepan.3. 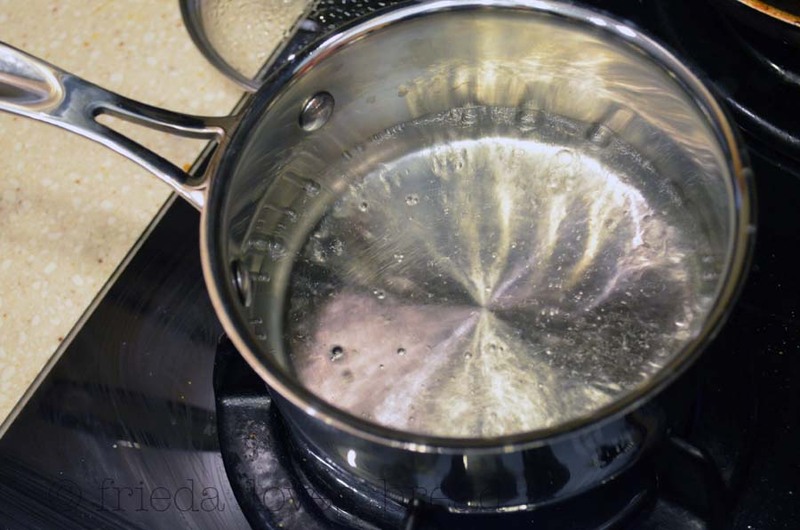 Bring about 1" of water in saucepan to almost a boil.4. Remove pan from stove and place one bowl of chocolate compound coating over the saucepan.5. Stir until almost melted.6. Remove and place bowl onto kitchen towel. Repeat for the other two bowls of compound coatings.7. 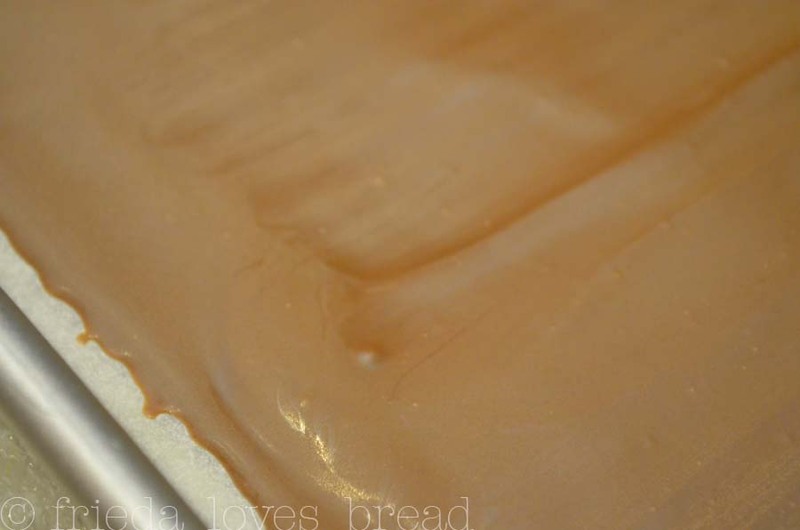 Pour one bowl of melted chocolate coating onto the center of parchment paper. 8. 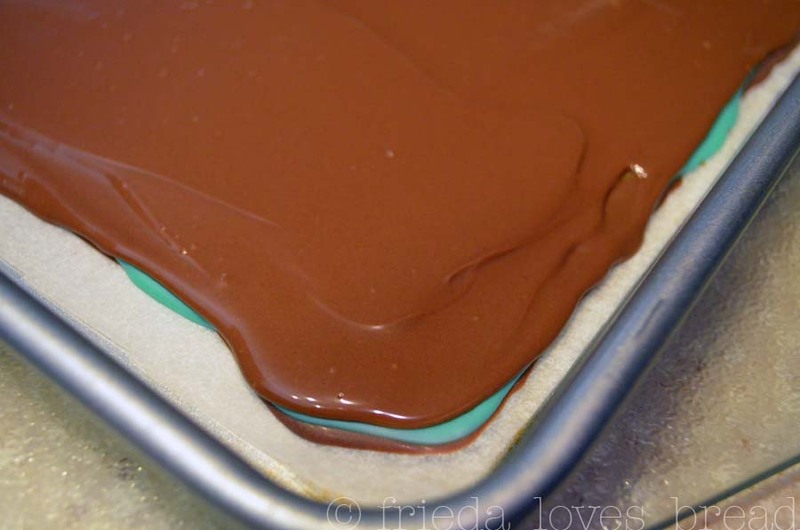 Using an offset spatula, spread the chocolate into a 10"x7" rectangle that is 1/8" thick. 9. Wait 1-2 minutes till layer has a matte finish. 10. Pour melted mint layer on next and spread to the edges. 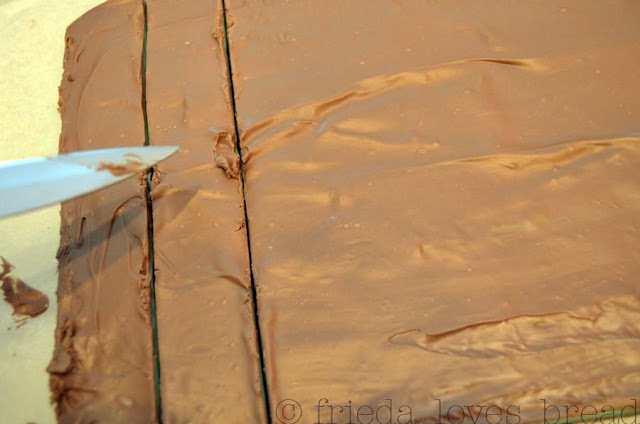 Let set to a matte finish and repeat with second chocolate layer. 11. Wait about 15 minutes to set and cut into 1" squares. 12. Store in an airtight container and keep in a cool area. All your stuff always looks amazing, Frieda! This one looks exceptionally yummy! Thanks, Jana! This is particularly addicting.... I love anything with the chocolate and mint combo. Have you ever made these with guittard chocolate chips and if so did it work the same? No I haven't. The texture may be different as ingredients are added to chips to help them hold their shape. Compound coatings have a smoother "mouth feel" than chips, in my opinion. It would be worth a try, making a small batch, wouldn't it? Let me know if it works for you!